Title text: But I've made $13.72 already today! Ow, stop throwing pennies. This is the second comic in the Well series: The first was 561: Well. The average person's lifespan is 80 years now. So, while immortality may become a reality within the coming century, Ponytail won't live long enough to achieve it. Cueball is looking for a programming language that does not need him to be specific about his ideas. When humans communicate ideas to other humans they may be vague but still understood, since the listener can infer a lot of detail from context and basic knowledge. Until we start 'raising' compilers (like you would a child) compilers will not possess that feature. Hence the need for the programmer to be exact in communicating his ideas to the compiler. No language will ever be able to change that. Cueball complains that he knows what he means. Finally we find out that one of Megan's admirers, Mike, whom she avoids, is hiding in the well. He has been waiting for her to come for her uncomfortable truth, so he can make her believe that she is actually attracted to him. But she is not so easily fooled and calls his bluff, telling him to come out of the well. The title text suggests he might also have been down there for the money everyone is throwing in to the well to get this uncomfortable truth. So it has never been a working well. When everyone (or just Megan) finds out about this, Mike is bombarded with the all the pennies people have brought along. In the comic game 1608: Hoverboard there is also a well in the left part of the world. This well has the same type of covered top and at the bottom (it is very deep) there is a girl and above her a coin, like the one thrown into a wishing well. 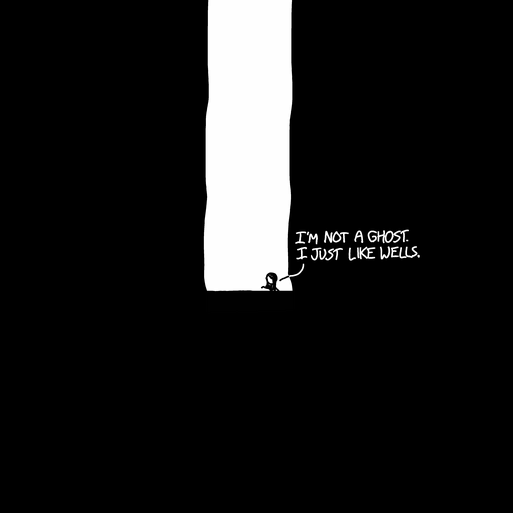 On these links, to images on xkcd ; used in the game, the top and the bottom of the well can be seen. Well: Science may discover immortality, but it won't happen in the next eighty years. Sign: The Uncomfortable Truths Well. Well: You'll never find a programming language that frees you from the burden of clarifying your ideas. Cueball: But I know what I mean! Well: You avoid your friend Mike because you're uncomfortably attracted to him. Megan: Get out of the well. Mike (from inside the well): Aww. What you need to do is invent audio. Some sort of a warm wax jar that will take an imprint of sound-waves that you can collect ideas in. With enough jars you could explain the idea as you go -even include problem solving with each step. It just requires some sort of mechanism to read it back later. And something to cool the wax and keep it solid until needed. This page was last edited on 26 October 2016, at 14:41.